Introduction: Giant cell tumor (GCT) also called osteoclastoma of bone is the most common osteolytic bone tumor encountered by an orthopedic surgeon. En bloc resection of major joints creates a problem for the reconstruction of large defects. Recent advances in tumor resection defects involve the use of custom-built joints for the reconstruction of defects near joints. This article analyzes the functional outcomes after resection of juxta articular GCTs and reconstruction by custom mega prosthetic arthroplasty. Aims and Objectives: To study the functional results of custom mega prosthetic reconstruction in juxta articular GCTs with intra articular extension. Materials and Methods: Four patients with juxta articular GCTs around the hip and knee with mean age of 40 yrs (range 30 to 50 yrs) underwent resection and reconstruction by custom mega prosthetic arthroplasty during the period 2011 to 2013. Two patients were males and two were females. All of them were in Enneking stage 3. 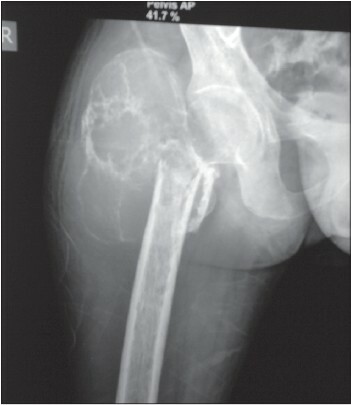 Proximal femur was involved in one patient, distal femur in one and proximal tibia in two patients. Results: Functional results were analyzed using Ennekings criteria. Excellent results were obtained in all the patients without recurrence, periprosthetic fractures, infections or aseptic loosening. Conclusion: By using the technique of custom mega prosthetic reconstruction in juxta articular GCTs with pathological fractures or intra articular extension, the desired goals of reconstruction with good functional results and least complications can be achieved. Giant cell tumor (GCT) also called osteoclastoma of bone is the most common bone tumor encountered by an orthopedic surgeon. 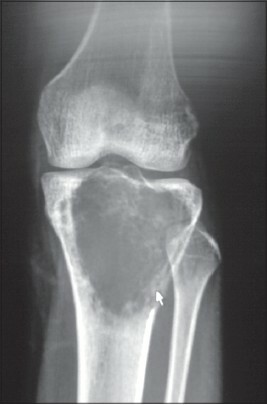 GCT generally occurs in skeletally mature individuals with peak incidence in the third decade of life. Less than 5% are found in patients with open physes and only about 10% of cases occur in patients older than 65 years. Giant cell tumors (GCTs) represent 3-4% of all primary tumors of bone. Distal femur and proximal tibia are the most common sites followed by the distal radius. The ideal aim in the management of GCT is to eradicate the tumor without sacrificing the joint. Current treatment modalities including a meticulous curettage with extension of tumor removal using high speed burrs and adjuvant local therapy. However, with these modalities there is a recurrence rate of 60%. Wide resection should be the treatment of choice, especially for situations such as recurrences, pathological fractures and tumors, which are frankly malignant tumors. , En bloc resection of major joints creates a problem for the reconstruction of large defects. Recent advances in tumor resection defects involve in the use of custom-built joints for the replacement of defects near joints. This article analyzes the functional outcomes after resection of juxta articular GCTs and reconstruction by custom mega prosthetic arthroplasty. Seventeen patients with juxta articular GCTs around the hip and knee were treated. Ten patients in early stage of disease were treated with curettage and bone grafting/cementation. Three patients in stage 3 were treated with resection and arthrodesis. Four patients with juxta articular GCTs around the hip and knee who underwent resection and reconstruction by custom mega prosthetic arthroplasty during the period 2011 to 2013 were analyzed in this study. Those patients who were treated by curettage and bone grafting/cementation or arthrodesis during the same period were excluded. Two patients were males and two were females (ratio of 1:1). The age group of patients was average of 40 yrs (range 30 to 50 yrs). All of the patients were histologically proven by fine needle aspiration cytology (FNAC) or open biopsy. 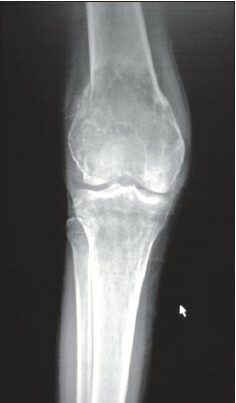 Proximal femur was involved in one patient [Figure 1], distal femur in one [Figure 2] and proximal tibia in two patients [Figure 3]. Surgical staging was done according to the Enneking's staging system. All of them were in Enneking stage 3. The custom mega prostheses made up of stainless steel and manufactured in Delhi, India were used. 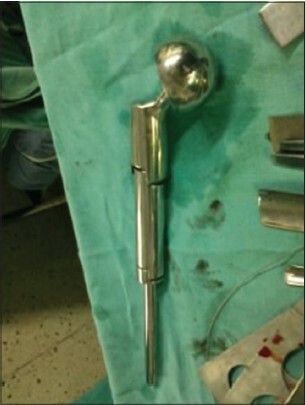 The basic components of the prosthesis are a femoral head component of bipolar design with diameter of 46 mm, a proximal femoral shaft component of length 80 mm with neck shaft angle being 135 degrees, a stem of length 10 cm with collar bushes [Figure 4]. This hinged custom mega prosthesis contains a femoral condylar component, a pivot pin, a thrust-bearing pad made of ultra high molecular weight polyethylene and tibial component. Proximally, the prosthesis is angulated laterally by 6° to resemble the valgus angle of the lower limb. The function of the thrust-bearing pad is to impart a flexion of 150° between the femoral and tibial components. The ultra high molecular weight polyethylene-bearing pad serves to relocate the load transmitted during weight bearing. Measurement radiography and magnetic resonance imaging (MRI) were used to estimate the size of the prosthesis to be used. For GCT of right proximal femur, with patient in the left lateral position on table, posterior Moor's approach extended distally over the lateral aspect of right thigh encircling the biopsy scar was used. 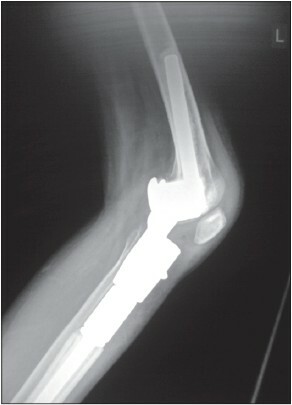 Complete resection of the tumor bearing part and replacement with cemented custom mega prosthesis was done [Figure 5]. Proximally, the prosthesis was anteverted to 15 degrees. Vastus lateralis muscle was sutured to the hook given to the prosthesis. Adductor tenotomy was done to compensate weak abductors. After closure of the wound a cylindrical slab was applied to avoid knee bending and hip flexion. Quadriceps strengthening exercises were started from the second post-operative day. Protected weight bearing with the help of walker begun after suture removal and patient instructed to keep limbs in wide abduction and not to squat at the time of discharge. For GCT of distal femur, extended medial parapatellar approach encircling the biopsy scar was used. This approach aids in vascular dissection, so that the popliteal vessels can be separated and tumor dissection carried out. We used the technique of sleeve resection of quadriceps musculature. The main objective of this technique is to excise a sleeve of quadriceps musculature all around the tumor but retain the functioning rectus femoris tendon. The excision removes a portion of the vastus lateralis, medialis and intermedius, but preserves enough musculature to provide soft tissue coverage for the prosthesis and retains adequate extension power. By this technique, we were able to attain a balance between achieving adequate surgical margins and retaining sufficient musculature. 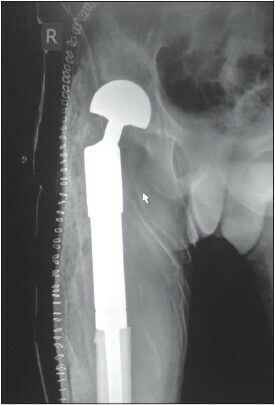 Resection of the tumor bearing part followed by reconstruction with custom mega prosthetic arthroplasty was done [Figure 6]. For GCTs of proximal tibia, extended medial parapatellar approach encircling the biopsy scar was used. Resection of the tumor bearing part and a medial gastrocnemius rotational flap was done. The extensor mechanism was repaired by direct suturing of the patellar tendon to the hook given to the prosthesis. Quadriceps strengthening exercises were started from the second post-operative day. Patient was allowed to walk with the help of walker on the third post-operative day. On the fifteenth post-operative day, sutures were removed and patient was discharged. Knee bending was started after 3 weeks [Figure 7]. The minimum follow-up was 18 months. Functional results were analyzed using Enneking's criteria. This system was developed as a clinically based evaluation tool to measure functional outcome in patients with musculoskeletal tumors. It is based on seven primary factors: motion, pain, stability, deformity, strength, functional activity and emotional acceptance. The criteria for rating are: excellent, good, fair and poor. In our study, excellent results were obtained in all the patients without recurrence, periprosthetic fractures, infections or aseptic loosening. Hence, custom mega prosthetic arthroplasty has become the method of choice after bone tumor resection at the hip and knee. It is the primary modality in the treatment of aggressive bone tumors of lower limb. The use of custom mega prosthesis is a simple and technically superior method of feeling the bone defects in benign aggressive lesions with pathological fractures and, where skeletal reconstruction is difficult after intra-lesional curettage. The advantages of custom mega prosthetic arthroplasty are least rates of recurrence, immediate resumption of knee function with early ambulation. The possible complications include flap necrosis, secondary infection, aseptic loosening and breakage. In cases of GCT, the management depends upon the various factors such as site, age, involvement of the bone, extent of bone involvement and whether there is articular involvement or not. If tumor is involving more soft-tissue with involvement of neurovascular structure then limb salvage surgery will not be possible. If there is intra-articular extension, then the main aim of management should be eradication of tumor without sacrificing joint function. By using the technique of custom prosthetic reconstruction in juxta articular GCTs with pathological fractures or intra-articular extension, the desired goals of reconstruction with good functional results and least complications can be achieved. 1. Natarajan MV, Prabhakar R, Mohamed SM, Shashidhar R. Management of juxta articular giant cell tumors around the knee by custom mega prosthetic arthroplasty. Indian J Orthop 2007;41:134-8. 2. Eckerd JJ, Grogan TJ. Giant cell tumor of bone. Clin Orthop Relat Res 1986:45-58. 3. Ghert MA, Rizzo M, Harrelson JM, Scully SP. Giant-cell tumor of the appendicular skeleton. Clin Orthop Relat Res 2002:201-10. 4. Szendröi M. Giant-cell tumour of bone. J Bone Joint Surg Br 2004;86:5-12. 5. McGrath PJ. Giant-cell tumour of bone: An analysis of fifty-two cases. J Bone Joint Surg Br 1972;54:216-29. 6. Kawai A, Lin PP, Boland PJ, Athanasian EA, Healey JH. Relationship between magnitude of resection, complication, and prosthetic survival after prosthetic knee reconstructions for distal femoral tumors. J Surg Oncol 1999;70:109-15. 7. Hillmann A, Hoffmann C, Gosheger G, Krakau H, Winkelmann W. Malignant tumor of the distal part of the femur or the proximal part of the tibia: Endoprosthetic replacement or rotationplasty. Functional outcome and quality-of-life measurements. J Bone Joint Surg Am 1999;81:462-8. 8. Natarajan MV, Annamalai K, Williams S, Selvaraj R, Rajagopal TS. 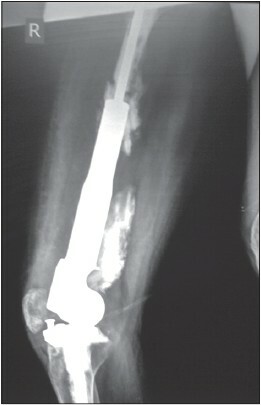 Limb salvage in distal tibial osteosarcoma using a custom mega prosthesis. Int Orthop 2000;24:282-4.